If you ask a New Yorker about their city, they'll just smile and tell you it's the best place in the world. They'll tell you that you'll never find another city like it. As a guy that's about to hit his one-year mark here in the big apple, I'll say that it's been a remarkable introduction to what would seem to be, according to the New Yorkers in my life, the center of the universe. Ostensibly, I can agree that it's about as close as you'll get to the artistic and intellectual heart of modern civilization. A truly romantic place, if you care to take a look around. Taken at a glance, New York shares similar attributes to many of our nation's great metro centers; just like NYC, one can find amazing food, art, sports, theater, and all the other frivolities of big city life in Chicago, Seattle, Boston, and San Fransisco, to name a few. But unlike those cities and until quite recently, you couldn't really find great local beer in New York. It was a get-anything-you-want-anytime mosh pit that didn't have the craft beer pedigree you would expect from a city of such cultural depth and global impact. At the turn of the 20th century, it was the nation's most productive beer town, but has been sadly behind the curve since then. To my New York friends who exist in the beer community, this is a tired narrative, and one they've done a great job of combatting in recent years. Like many areas of our country, the last 5 years has seen a massive increase in the number of local beer producers in New York. Since 2010, over 25 new breweries have opened in and around New York City, and that number keeps rising. The original stalwarts over at Brooklyn Brewery got started in the late 80's, and have since paved the way for all manner of craft-inspired brewpubs, restaurants, and production breweries here in the city. Come to New York today and you'll find hundreds of bars dedicated to great local beer, and a growing group of patrons willing to try them. Rockaway Brewing Company is not a brewery for braggarts. It's small. The taproom is lightly decorated and functional in its approach. A few stools, a few windows, a couple pieces of art on the wall, and a bar. The building is covered in funky graffiti and sits on an unassuming street corner in Long Island City, Queens, calling little attention to itself. It's the epitome of a small, urban business in many ways, and I'll be honest here, it's pretty much the best kind of place to drink a few beers and have a conversation. I sat down with Ethan Long, co-founder of Rockaway Brewing Company, to talk to him about the business of making great beer in New York City during such an exciting growth period for the city's breweries. During our conversation, I realized that Ethan wasn't the kind of stereotypical NYC entrepreneur I might expect . His earnest, humble vision for Rockaway didn't involve big distribution, huge sales projections, or a large-scale investment in infrastructure and equipment. This might happen, but it wasn't the impetus that got him going. He did it because he really enjoyed brewing beer, and he mustered up enough energy to build place where he could share it with you. Ethan, and his cofounder Marcus, are Californians, which lends some serious credibility to their craft beer credentials. It was a west coast trip that inspired Rockaway Brewing Company. Ethan fell in love with the way folks were consuming beer out west. "We were having a few beers in Portland and said to ourselves "we should really sell this stuff in NYC". That's all it takes, after all, to the light the fire for an entrepreneur. Before the west coast trip, Ethan and Marcus struck up a friendship in Far Rockaway, surfing by day and homebrewing in their beach-side bungalows. At one point, Ethan chuckled loudly, "I built a lagering cellar in the floor of my house, so we could have a cool place to store our beer at the beach." I can only imagine how much sand you would have to remove for that to be effective. Completely self-funded, they found their current space in Long Island City in a former meat-packing complex. The industrial, blue-collar vibe that permeates most of Queens is rapidly dissipating in this part of town, but you can still see, and feel, the vestiges of a neighborhood the once existed here, fighting off the encroaching high-rise luxury towers down the block. "We didn’t’ have the money to get a big brewery going" said Ethan, "so we bought a two-barrel brewery from a guy out in Portland and went from there. We wanted to plant our flag for local beer." Their love a great beer is matched by their appreciation of New York's pioneering restaurant scene. Much like wine and food, Ethan is happy to see the explosion in popularity between craft beer and food, "Food and beer roll off the tongue much easier at restaurants and bars than they used to." That sentiment, which has fundamentally changed the way folks approach good beer, means that great beer is no longer relegated to specialized craft beer bars with 1000 taps. Craft beer has become, to many, a truly gourmet experience. 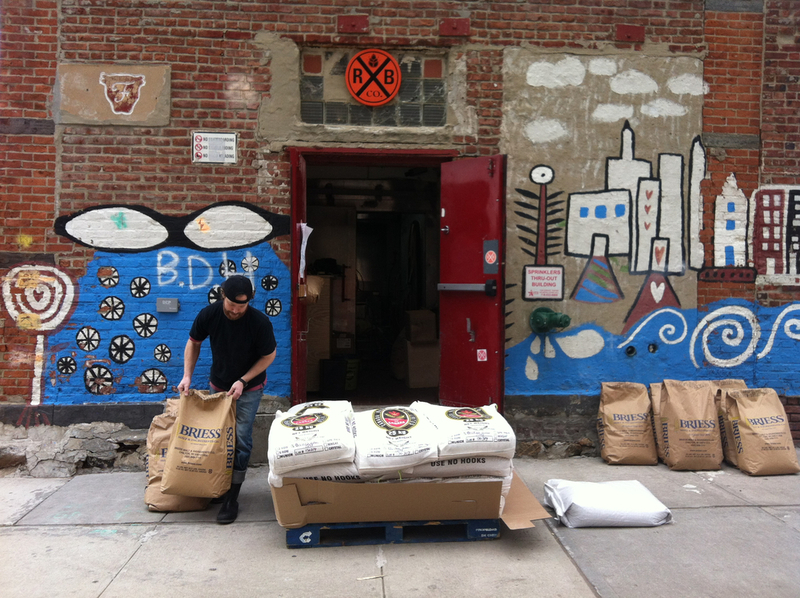 I asked Ethan if he saw that dynamic evolving even further for a brewery like Rockaway. "Absolutely. We like to be in a place that has just a couple beers on tap and they can focus on our beers and their food. It’s good to be in a big craft beer bar, but we want to be in a smaller conversation too." The old 2-barrel system. RBC is rolling on 5 barrels these days. I tried RBC's beers a few years ago (they're all unpasteurized, for the record) during a visit to New York, and they've only gotten better as the brewery has grown. Stylistically, their brewed for a classic flavor and aroma with a subtle, unique charm imbued into almost every beer. The nitro stout on draft, admittedly, blew me away. Ethan's take on the brewing process sums it up nicely. "I love so many styles of beer, so we try to make our beer to our sensibilities and taste. As an example, Our ESB got dialed in over the past few years, so it's malt-forward and perfectly balanced. I also like to be playful with our beers. I’m not hell-bent on making the hoppiest beers imaginable." He continued, "There’s a physical building process in my head, so it’s not always about brewing to a perfect style, but more about the way the grains work with the yeast. It's fun because you might stumble on an interesting flavor profile. I look into old methodologies of brewing and play with how I structure the beer. At the end of the day, we’re not chasing the market out there. We're making out own stuff." RBC is part of an inspiring cohort of breweries that have opened in Long Island City the past few years. Their brewing neighbors over at Transmitter Brewing, Big Alice Brewing, and LIC Beer Project have already garnered some seriously impressive accolades and a dedicated local following during their recent tenure. You can actually spend a pleasant day walking to each of these breweries, which I did earlier this year. I wasn't remotely sober when I finished, and you and I both know it would be a shame if I was. So what does it all mean? Being a small New York craft brewer is difficult. The rent is bonkers, the competition is fierce, it's not that easy finding the right space in a crowded city. But most importantly, the bar for a quality brew is high. Local entrepreneurs like Ethan and Marcus are building on a foundation of east coast brewing tradition and energizing a market ripe with thirsty consumers. New York is, after all, huge. If you're reading this, and you don't already live here, then you'll probably be visiting soon (everyone has a friend in NYC after all). Grab a fresh slice, hop the 7 train, and head over to Queens for the day. You'll be happy you did. We promise.